The statue of Che Guevara and a boy is dedicated to the life and person of Che. The child represents the future and Che's body is adorned with miniatures scenes from his past. 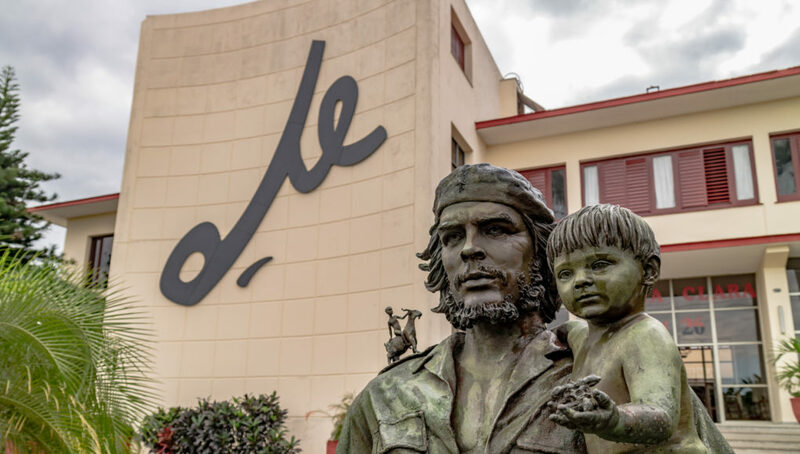 One of the lesser-known memorials to Che Guevara in Cuba is the statue of Che and a child that’s located at the provincial headquarters of the Cuban communist party in Santa Clara. The child that Che is holding represents the future. In various places around Che’s body, small figures represent various stages or events in Che’s life. For example, there’s a little motorcyclist representing Guevara’s travels in South America. At his waist, his belt buckle is opening like a stage or ramp with a crowd of comrades marching arm in arm celebrating their triumph in the Cuban revolution. The sculpture was created by Basque sculptor Casto Solano Morroyo and unveiled in 1999. It’s located just a few blocks east of the Parque del Tren Blindado (Park of the Armored Train) that commemorates the pivotal battle of the Cuban revolution. 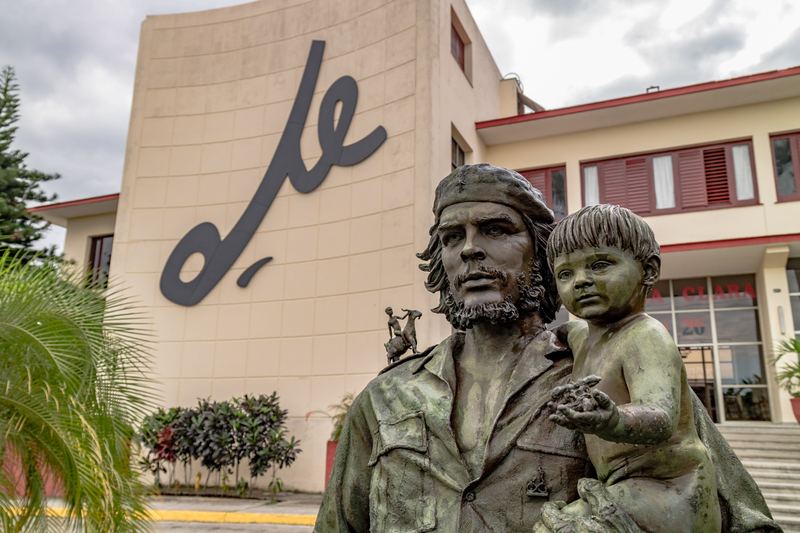 Che Guevara depicted striding forward from the provincial headquarters of the Cuban communist party with a small child in his arms. Small figures scattered in various positions around Che’s body represent events or stages of Che’s life, such as the boy riding a goat on Che’s shoulder that represents Che as a child riding up a Bolivian mountain. Che’s famous trans-American motorcycle journey is depicted by a little motorcycle rider in on of the folds of his uniform. Two figures representing a boy and girl seeking Che’s heart from their base of the symbol for infinity. Che’s belt buckle shows Che and other revolutionaries walking arm in arm and celebrating their victory in Cuba. Two tiny figures climb up Che’s uniform, representing Che climbing on Mexico’s volcanoes with Fidel Castro. Near where a bullet entered his body, a young girl peers out of a window, waiting hopefully for Che to return. Next articleFandango at the Bulb!